"I wish me and my husband could do more of my favourite things together; swimming, boating, diving. But he gets a cold every time we get wet from early autumn to late spring. Humans just aren't build for the coast, I guess." 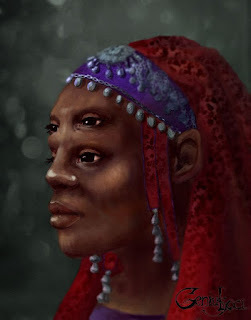 Beja (speak: beh-ya) have almost black skin, black hair, and two pairs of either black or bright blue eyes. Their upper eyes can see in dim light and under water. Beja are expert breathholders, and rarely get sick from contact with water, be it infection or pneumonia. Those facts have led to the widespread folklore connection between beja and the element water; the Swordmaster is often depicted as a beja. 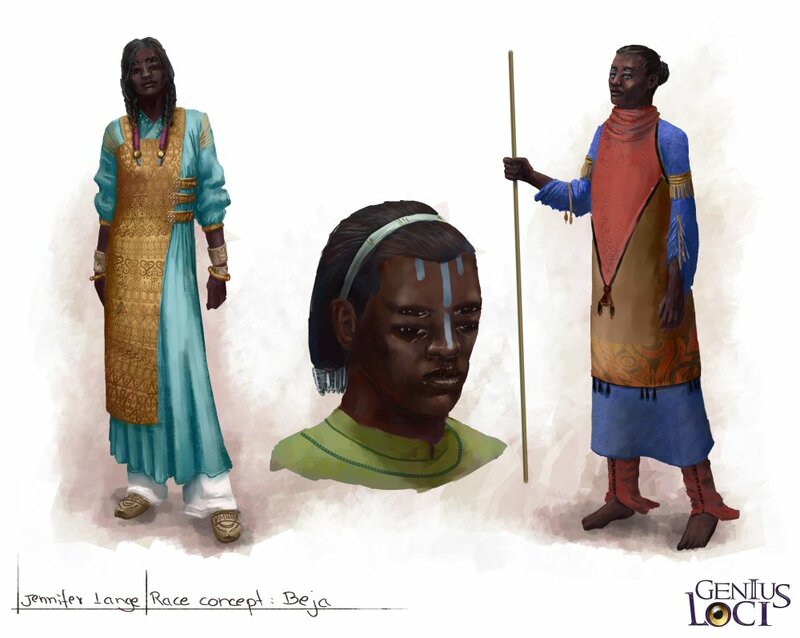 Beja tend to deep thought and often become philosophers and politicians. The famous Ghabnah, founder of the mages' tradition and author of the Book of Magic (commonly called Ghabnah's book), was a beja. The most dreaded ability of beja is their life control - a beja can drop dead on the spot, simply by willing it. Hence, they make both exceptionally bad hostages and easy targets for assassinations, and societies are careful to not back them into a corner. "Life was worth little in ancient Hremur; it was common to consider suicide in dire stress. Many beja died this way, but only when the beloved prince willed his life to end for an insignificant matter of honour did the culture begin to change, to preserve at least his brother." I always eagerly await comments about the seasick feeling one gets when looking at a beja, and I have to say it is one of my most successful designs. Earlier versions had black lower and blue upper eyes, but I think all four eyes in the same colour looks nicer. Beja have the storytelling advantage of seeming very human, but allow me to whip up some exotic little feature anytime I need to. 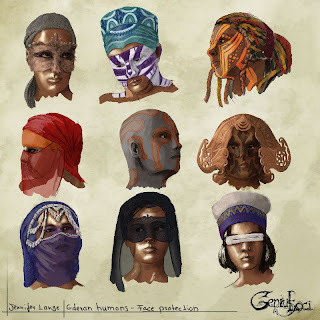 This concludes the racial templates - all major races of the Genius Loci setting have now been described: garren, humans, elves, dwarves, shankeh, raganaj, and beja. 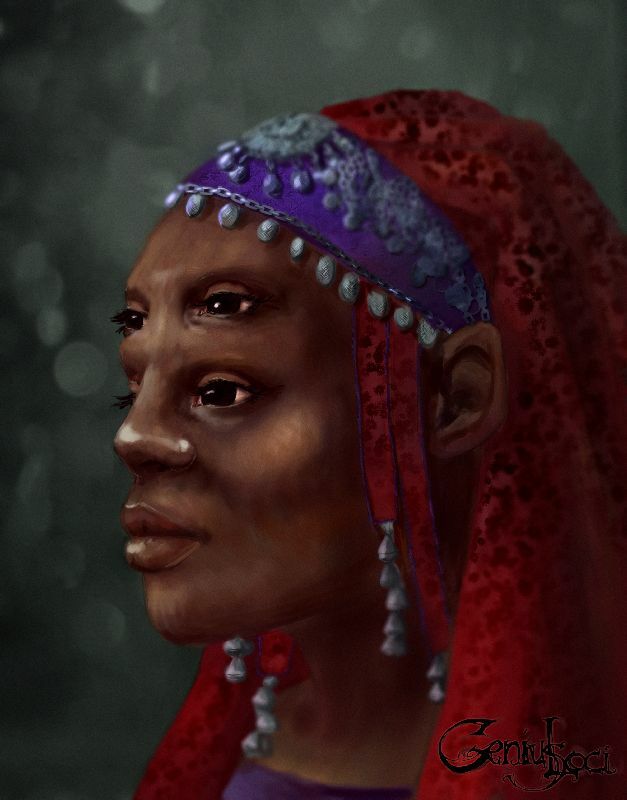 There are other races, like the goodminded, digging mul'ahman or the mute "Hünen", or the mysterious seraphs or rhu'khach, who will be presented later. "The day I realised my shimmer was entirely gone, I cried, and cursed the wretched foreign lands my lord had sent me to. When I found it in my skin again after my return, I held a feast on that day every year." All inhabitants of Gdera have "the shimmer". It's a gleam of the skin and hair, like powdered metal, and considered rather attractive. Humans, however, shine and don't just shimmer, in an amount that can cause eye damage. Because of the humans' need for it, many cultures wear ornamented eye protection. Travellers acquire the shimmer soon after their arrival in Gdera and loose it after their departure; again, not humans. The shimmer is an honour badge of sorts, and Gderans look down their shimmering noses on those who have none. The strong eye makeup of desert peoples from the Egyptians onward is in fact protective against sun and parasites. I always liked adding decorum to portraits, and have a wide range of choices from mud to silk veils with the shimmer. In any case, distorting faces with patterns or hiding them behind veils and masks is an interesting character design feature.